Montana Highway Patrol Sergeant Kurt Sager demonstrates for legislators part of a field sobriety test on a participant, tracking his eye movements. Feb. 12, 2019. This week, the Highway Patrol hosted a demonstration with live intoxicated volunteers to show just how much alcohol it actually takes to be beyond legal limits. Monday’s event included four volunteers from Highway Patrol who drank a substantial amount within two hours, and then were given a field sobriety test, including a walk-and-turn test. It proved to be tricky for some. 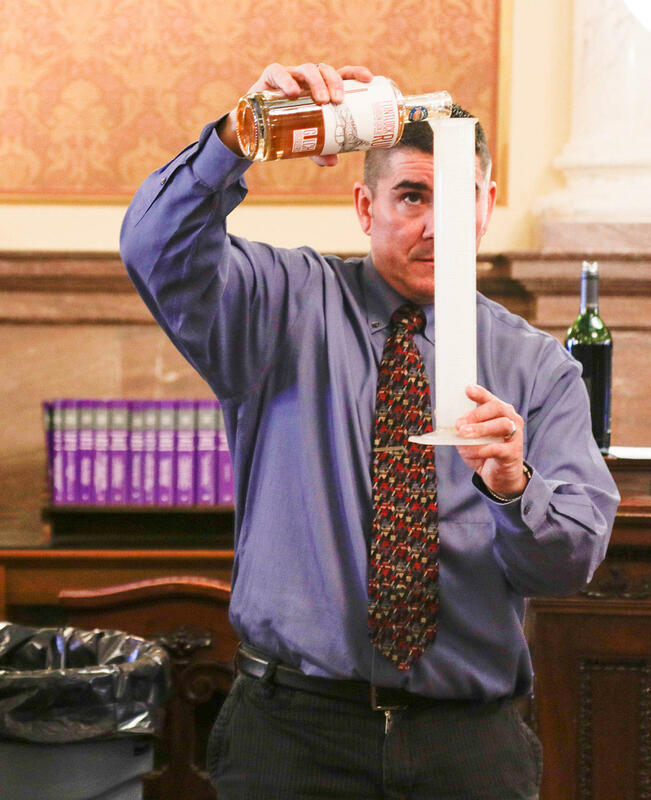 Ben Vetter, director of the Breath Analysis Program in the Montana Crime Control Division, measures out alcohol for a drink. Participants were given a certain amount of alcohol based on their height and weight. Feb. 12, 2019. MHP Sergeant Kurt Sager says the event’s aim was to show lawmakers that someone who has one or two drinks at dinner will not have had enough to be charged with a DUI, but that it takes substantial drinking to reach a .08 BAC, the legal limit. That, he says, is key in understanding why a section of Senate Bill 65, which would allow law enforcement to take a blood sample using a warrant on a first offense, is important to decrease drunk driving in the state. “Well, 72 percent of Montana’s DUIs are first-offense DUIs, so that’s an issue we need to address,” Sager said. Sen. Keith Regier, R-Kalispell, is sponsoring SB 65 and says the bill will not only address drunk driving, but will make the law clearer and easier to interpret. 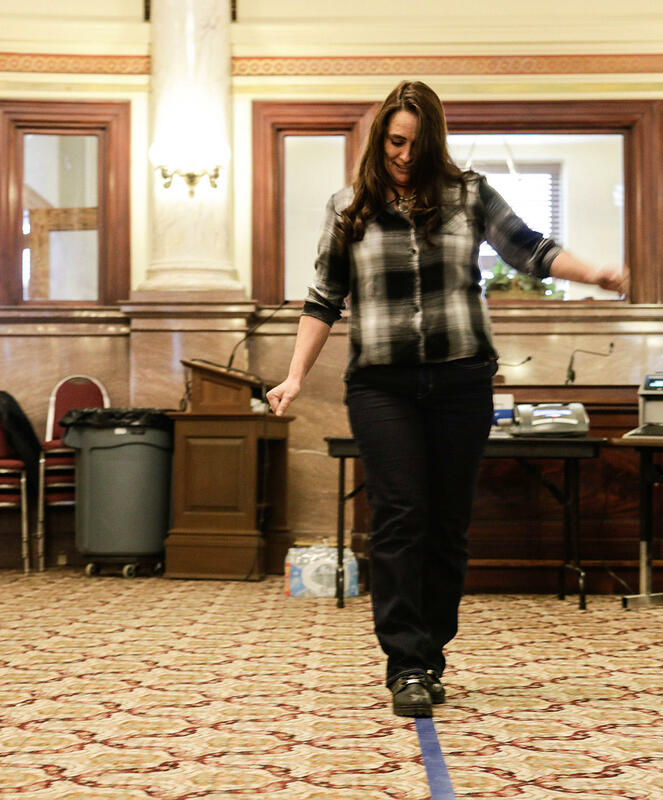 Terie Moseman participated in the DUI lab and took a field sobriety test as an example for legislators to watch on Feb. 12, 2019. HELENA -- A bill in the Legislature would change DUI laws in Montana, making it legal for officers to take a blood sample from someone who refuses a breathalyzer on the first offense and increasing penalties for aggravated cases.